And oh boy, they really are!! As a member of the Entrepreneurs' Exchange, at the end of 2011 I was lucky enought to be invited to sponsor and mentor a Year 10 student in Barnsley as part of the I Know I Can - Barnsley Big Challenge, a scheme which encourages and supports young budding entrepreneurs to set up their own businesses while still at school. I chose to mentor Jade Bryan, the brains and talent behind Jade's Heavenly Buns - partly because the name made me laugh, and partly because, well, who doesn't love cake?! She bakes cupcakes, sweet treats and celebration cakes, making all the intricate and beautiful decorations herself lovingly by hand! Jade's baking skills clearly needed no help from me (apart from, er, sampling - purely for quality control purposes, you understand!! 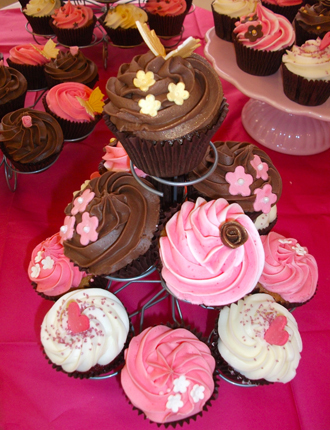 ), but she was keen to find out more about how she could market her delicious cupcakes to a wider audience. She explained to me how she had set up a regular weekly stall at Kirk Balk Community College, and had already grown quite a following within her school environment, but she wanted to spread the goodness further. We worked on developing a logo to epitomise the brand, and some more branding and marketing techniques which she could apply. Jade arranged to have branded shirts made for herself and her mum (who helps to man the stalls). She then took part in her first 'public' sale - a tremendous opportunity to host a stall at an amazingly popular wedding fayre held at the beautiful venue Rutland House in the centre of Doncaster. Organised by Apple Blossom Events, the wedding fayre was an ideal opportunity for Jade to showcase her products and raise the profile of her business. In addition to the mouth-watering cupcakes, she also makes stunning celebration cakes for weddings, birthdays, anything at all, and has already received a number of bookings to supply cakes for weddings this summer! WOW, what a fabulous night! At the IKIC Awards Evening 2012, I'm delighted to announce that Jade's Heavenly Buns swept the board! It began confidently as Jade collected the 'Most Profit Made' award, then moved on to pick up the Key Stage 4 Winning Business award. As an amazing and unexpected addition, I was awarded the joint first prize as Entrepreneurial Mentor 2012 for my work supporting Jade's business throughout the competition. Finally came the big moment (cue the drum roll...) - the announcement of the IKIC Best Business 2012. "And the award goes to....Jade's Heavenly Buns!!!" Absolutely fantastic, thoroughly deserved and came as complete recognition of Jade's immense talent and commitment to her business. She's worked incredibly hard over these last few months, and her armfuls of awards justify all her effort. I'm SOOOO proud of her! IKIC Barnsley Big Challenge is an Enterprise Competition running across Barnsley Secondary Schools, Barnsley College and Barnsley Community Groups. It challenges young people aged 11-19 to develop their own business from an idea through to trading, leading to final awards in June each year. I'm delighted to be involved again for the 2013 competition - but as I could never expect to top the dizzy heights of last year's success with Jade, this time I'm taking part as a judge. My duties begin in early May, and I can't wait!